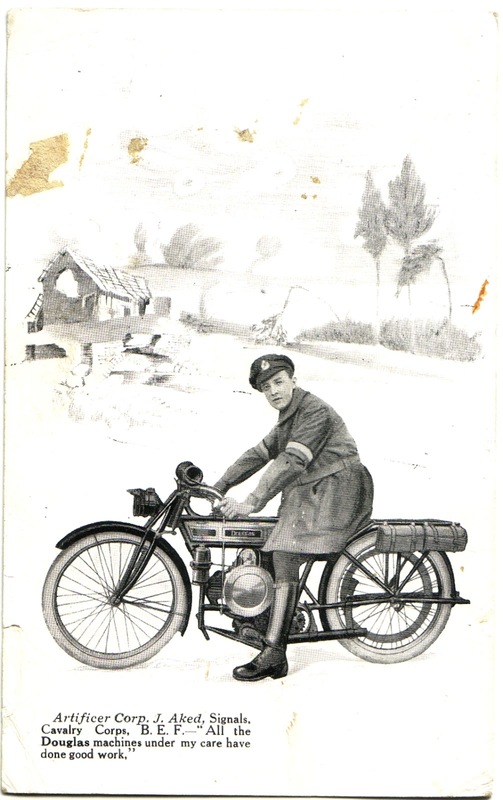 This postcard was published by Douglas to publicise the reliability of their bikes as demonstrated in the theatre of war. This particular postcard has actually been posted and the postmark is from 1922. Personally I had to do some quick research to find out what that all means, so for others also unfamiliar with World War One military parlance here is a quick explanation... An artificer is a skilled mechanic in the armed forces. So Mr J Aked was a Corporal in the Signals Squadron of the Cavalry Corps with a responsibility for mechanics (ie the Signals Squadron was the home of the Despatch Riders and Mr Aked was more than likely responsible for maintaining their bikes). The B E F was the British Expeditionary Force and refers to the British Army sent to fight on the Western Front. Frank Buckles, longest living U.S. vet of World War I, was a courier, at first issued a belt-drive Douglas. "It would go about 25 miles an hour," he later told a newspaper reporter doing a story on him. "Downhill." I think the Douglas motorcycles of that era were better known for reliability and smooth running rather than performance! Mind, it is easy to forget now that right up until the fifties the majority of miles covered by most motorcycles would be on unpaved roads (at least in the UK). When you look back at the riding attire of the era it is easy to see that it wasn't often that a chap would top twenty mph!